Getting to Berlin is easy from anywhere in Europe and from most places around the world. We are fortunate that most of the airlines serve the City’s two airports – Berlin Tegel (TXL) and Berlin Schönefeld (SXF). To make a reservation, please click on www.lh.com/event-flight-booking and enter the access code DEZQYGQ in the “Offer for discounted flights” area. This will open an online booking platform that will automatically calculate the discount offered or provide you with an even better offer if another promotional fare is available. Berlin has two main airports – Berlin Tegel (TXL) in the north west of the city and Berlin Schönefeld (SXF) in the south east. Berlin Tegel Airport (TXL) – International airport in centre of Berlin. Transport to CityCube about 30 mins. From Tegel airport take the bus 109 in the direction of ‘S+U Zoologischer Garten’ and get off at the station ‘S Charlottenburg’. From here take the S-Bahn 5 towards ‘Spandau’. Leave the train at ‘Messe Süd (Eichkamp)’ station which is approximately one minute by foot away from CityCube. Transport to CityCube about 60 – 75 mins. From Schoenefeld airport take the S-Bahn towards ‘Spandau’. Alternatively you can take the train RB14 in the direction ‘Nauen’ and get off at the station ‘S-Charlottenburg’. You can reach Berlin from every direction on the fast InterCityExpress, InterCity, EuroCity and InterRegio Trains. 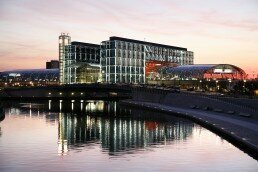 The new central station Berlin Hauptbahnhof is in the heart of Berlin. It was opened in 2006 and is well connected to the public transport system. To reach the Berlin Cube take the S-Bahn train towards ‘Spandau’. The CityCube offers a parking space P14 for €7.50 . Please note that there are no other parking facilities around the CityCube.